I've been a Jennifer L. Armentrout fangirl for a couple years now, so I was beyond excited to start her new series - and a little nervous as to whether or not it would live up to my expectations. 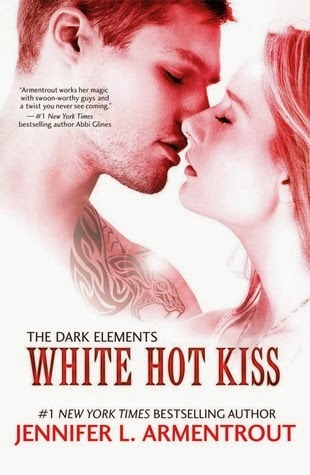 Fortunately, I completely loved White Hot Kiss. Like, help-I've-fangirled-and-I-can't-get-up loved it. I absolutely adored the premise of this book. Demons and gargoyles? It's such a unique idea, and the author really makes it work. Her world-building was believable and immersed me in the story. There was so much backstory; she clearly did her research and the world she has created is very fascinating. The plot held my attention the whole time, too. Not only is there a good amount of action and suspense, but there's an awesome twist at the end. The storyline took me on a crazy emotional rollercoaster and made me feel all the feels. As always with JLA, there was plenty of romance. There's a bit of a love triangle, but most of the romance is focused between the demon Roth and Layla. I just loved Roth. I mean, he has a killer snake named Bambi. 'Nough said. But really, he's a great - not to mention swoon-worthy - character. He isn't just in the story for the sake of romance; his character is complex and layered. Layla is also a strong heroine. She is slightly more shy and sweet than JLA's other heroines, which surprised me in a good way. This doesn't mean that she's a pushover, though. She stands up for herself and thinks things through. I enjoyed her character arc, and the romance between her and Roth is sizzling with chemistry. In case you couldn't tell, I'm totally Team Roth. There was only one thing that bothered me slightly. It seems like I've seen this issue popping up in the blogosphere lately, and it's the fact that in many of JLA's books, her heroines are all very alike with their feisty and witty personalities, and the love interest is frequently a bad boy who's mysterious and flirty. I do think her characters could use a little more variety, but at least Layla sticks out since she's a little more on the shy side. Overall, I was really impressed with this book. It has everything: strong world-building, a well-developed plot, a sweet romance, and strong characters. I was blown away by White Hot Kiss. This book stands out from all the other paranormal books, and I'm impatiently awaiting the release of the second book! * Thanks so much to Steph at Cuddlebuggery for sending me her ARC!